Cranes featured on and off recently on this blog, the reason being the construction of the Waterview Connection, a major tunnelling project for State Highway 20, completing eventually a ring route around Auckland. 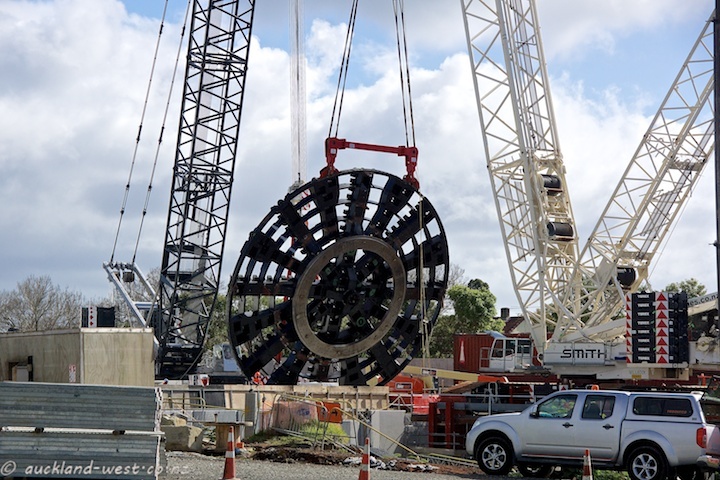 Main protagonist in the exercise is the Tunnel Boring Machine (“Alice TBM“), a gigantic beast of 14.5 metres diameter which will chew its way 2.4 km from Owairaka to Waterview and then back again. Engineered by Herrenknecht in Germany, and constructed in China, it is billed as the 10th largest such machine by head diameter. The machine was completely assembled in China, then taken apart and shipped to New Zealand, where it is currently being reassembled. The image shows the big cutting head of some 300 tonnes in weight being lifted by two cranes from its horizontal position. The big crane on the right will then rotate counterclockwise to lower the head into the pit below (out of sight) where it will be attached to the body of the machine. A list of largest TBM’s is here.